The FLSC90-A model has been discontinued. Please see the FP7002 Series as a possible alternative or contact our Flow Engineering Department. 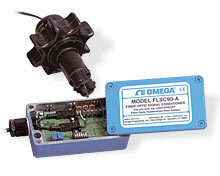 OMEGA’s Model FLSC90-A fiber-optic signal conditioner has been designed to interface directly with FP-9000 and FP-9000A series LIGHTSPEED TM paddlewheel flow sensors . The FLSC90-A provides a high intensity light source to the patented paddlewheel sensor through a semi-flexible duplex fiber-optic cable. Returning light pulses are measured and converted by the signal conditioner’s electronics to a scalable analog output that is proportional to the flowrate. The ability of the paddle wheel flow sensor to operate in harsh and heavy electrical noise environments via the fiber optic cable link makes this system ideal for such applications. The industry standard 4-20 mA or 1-5 Vdc analog output can connect directly to many of OMEGA’sprocess meters, controllers, dataloggers or data acquisition systems.